Creating a color/size matrix is a way to quickly populate your product database when you have products that differ from each only by size and color. Do not modify the product code of a matrix master or child product. If you want the child products to have the same photo and cost as the master product, you must add the photos and cost to the master product before creating the matrix. Create a product card, and on the Info tab click the Size/Color Matrix checkbox and click View Matrix. This designates the product as the master product. 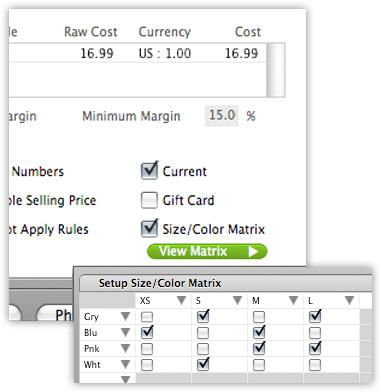 At the bottom of the Setup Size-Color Matrix grid click Color Sets and Size Sets and choose the sets you want to use. In the Setup Size/Color Matrix click the checkboxes for every size and color combination you want to create child products for and click Save. The child products are added to the product database, duplicating all the product info from the original master product. Each child product will have a unique product code and description.